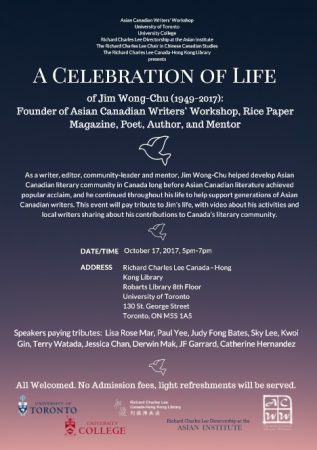 On October 17, 2017, a very special event took place in Toronto – A Celebration of Life event was held for Jim Wong-Chu, the founder of the Asian Canadian Writers’ Workshop and Ricepaper Magazine. 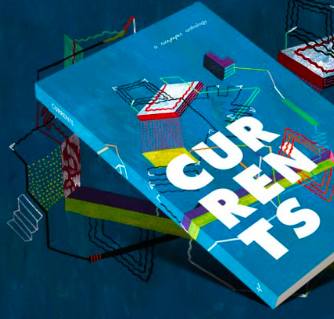 Although Jim lived in Vancouver, he frequently traveled to Toronto to visit writers, artists and friends in Toronto. 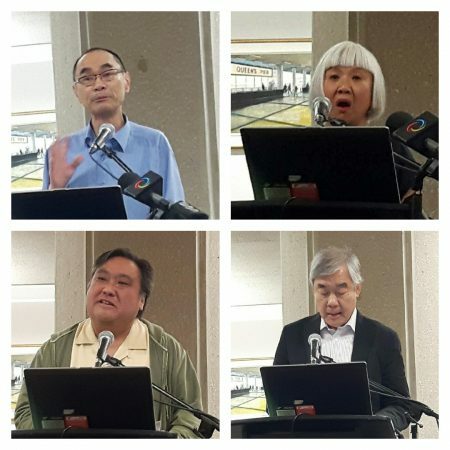 The event was sponsored by the University of Toronto and took place at the Richard Charles Lee Hong Kong Library inside the gigantic Robarts Library. 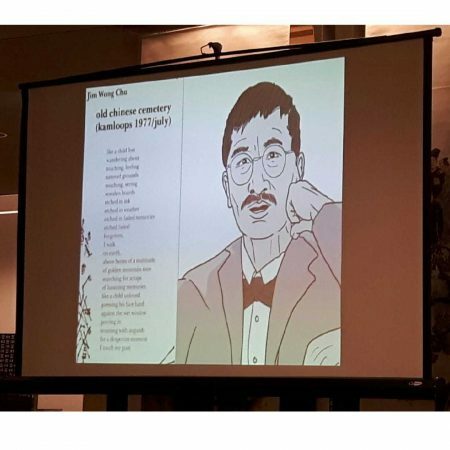 Many showed up to pay their respects and speakers paying tributes included: Lisa Rose Mar, Paul Yee, Judy Fong Bates, Sky Lee, Kwoi Gin, Terry Watada, Jessica Chan, Derwin Mak, JF Garrard and Catherine Hernandez. See pictures for some of the speakers below. Marlene, Jim’s widow, flew in from Vancouver and gave a touching speech about Jim. There were more than a few tearful talks which showed how much Jim is missed among family and friends. Our MC was the fantastic Cheuk who flew in from Vancouver as well to help us host the event. 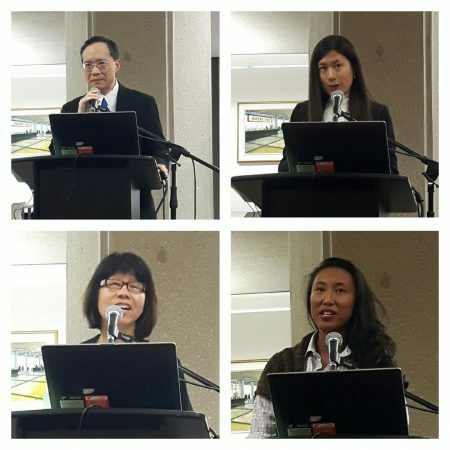 During this celebration of life we announced that there will be upcoming LiterASIAN events in Toronto. We hope to carry on Jim’s legacy here as well as in Vancouver to keep his spirit alive. 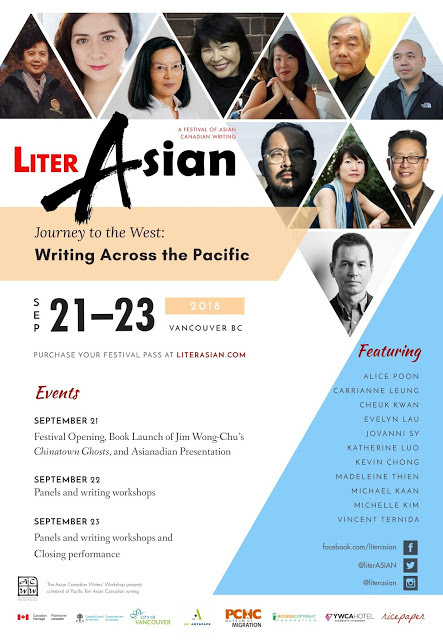 For people in Toronto, keep checking Ricepaper’s website for updates as there is more to come in 2018!